Ainslie has subsequently released five more, fine CDs—Terraplane (1997), You Better Lie Down (2002), The Feral Crow (2004), and Thunder’s Mouth(2008). These recordings offer a mix of blues, African-American traditional songs, and originals delivered with skill and emotion. His most recent collection, 2014’s The Last Shot Got Him, has a couple more Robert Johnson tunes, as well as compositions by Irving Berlin and Fats Waller. This CD takes its title from a ragtime blues by Mississippi John Hurt and contains a handful of his tunes as well. Ainslie’s own “Late Last Night” is outstanding. Scott Ainslie was inspired to take up guitar when he heard the blues artist John Jackson play in 1967. According to his bio, though, Ainslie’s mother found him at the family piano picking out melodies from the records she listened to during the day when he was just three years old. It seems that music and music education have always been a part of his life. He is a Phi Beta Kappa and honors graduate of Washington & Lee University. He is versed in Southern Appalachian fiddle and banjo traditions, and East Coast and Delta Blues. Ainslie gives classes and workshops in schools for teachers and students that explore the African and European roots of the music of the American South. He has also received awards and grants to acknowledge and fund his work including support from the National Endowment for the Arts and The North Carolina Arts Council. 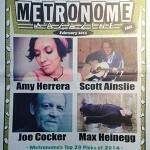 I enjoy Scott Ainslie’s music and it is a pleasure to share it on Back Porch Music. But as you can tell there is much more to Scott Ainslie than just the recordings that I play. Rather than offer a few YouTube clips, I’m going to suggest you head to his website where you can learn much, much more about him, and find links to video performances, instructional sessions and his music. Last Shot Got Him [has Scott Ainslie] putting down six swift Mississippi John Hurt songs, paying homage to the old master starting with The First Shot Missed Him. There has been a flurry of John Hurt covers lately, some lovely and some over the top with weird phonetic mimicking of Hurt’s voice and dialect that seem almost farcically, culturally misplaced, but Ainslie sings Hurt with dignity and does justice to him musically and artistically. It’s a respectful tribute with superior guitar instrumentation. He captures Hurt’s music closely to the original while making it his own, bringing on Avalon Blues, Let the Mermaids Flirt With Me, Honey Right Away, Got the Blues and Monday Morning Blues and every moment is a sweet spot. Mike Ragogna: Scott, your latest album The Last Shot Got Him was released back in October. What’s the reaction been to it so far? Scott Ainslie: From the moment the first copies have gone out I’ve received very positive responses from listeners. The quality of the recording and the performances have both garnered considerable praise. And The Last Shot Got Him was chosen as the December, 2014 “Recording of the Month” by Rad Bennett at SoundStage! Ultra–at http://ultraaudio.com. MR: How did the material come together for the project and what was the recording process like? SA: I recorded 17 tracks to choose from for this record and released fourteen of them. The guiding principle was the voice and vintage of the guitar, a 1934 Gibson L-50. All the tracks are songs and tunes that the guitar might have been asked to play when it was young–ca. 1928-1941. To call Scott Ainslie a musician is to shortchange his abilities; along with being a world class blues guitar player, Ainslie counts himself an author, historian, storyteller, and teacher. The Brattleboro, Vermont, resident – whose roots run deep right here in Virginia – was introduced to the blues as a teenager. Since that foundational moment when he was fifteen, Ainslie has maintained a passionate love affair with early American blues music, going so far as to transcribe the original works of the legendary Robert Johnson in his book Robert Johnson: At The Crossroads and produce an instructional DVD on Johnson’s playing techniques. Ainslie has also released five recordings, won grants from the National Endowment for the Arts and the North Carolina Arts Council, and has traveled the U.S. and Canada to share his brand of American folk music. 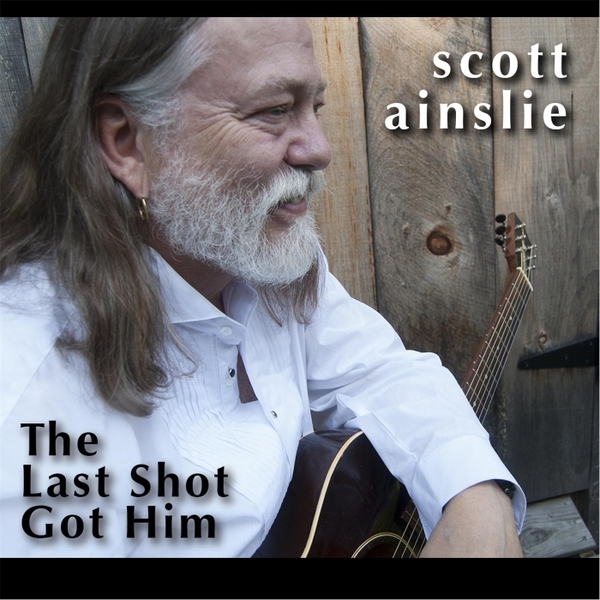 Recently, Ainslie released his latest record, The Last Shot Got Him, a collection of tunes originally recorded in the early twentieth century by such luminaries as Mississippi John Hurt, Robert Johnson, Fats Waller, and more. Ainslie I corresponded by email this week and I must admit to being transfixed by his responses to my questions. His understanding and appreciation of musical history virtually seeped through my monitor. Blues singer-songwriter-guitarist and historian Scott Ainslie is an innate musician and a true gentleman. After listening to John Jackson play at a high school assembly while in his teens, Ainslie found his way to music and never looked back. Over the years, he’s played with John Jackson, Ernie Hawkins, Etta Baker, Mike Seeger and the Fly By Night String Band, among others. He’s a gifted storyteller and an exceptional musician whose musical journey has enriched his life (and others) beyond his wildest dreams. We talked at length one winter day and he explained how he came to choose music as his calling…. In the music business, it pays to be versatile, to be able to play different kinds of music, since the opportunities for performing in any single genre tend to be limited. But at the same time, this can be confusing to audiences, who tend to like their performers to play one kind of music and maintain the sound that was won those fans in the first place. This week, we have a CD by a performer who shows his versatility by jumping from one style to quite another. Scott Ainslie’s new release is called The Feral Crow. Scott Ainslie, who was formerly based in North Carolina but relocated to Vermont recently, has developed a reputation as a blues historian, being the author of a book on Robert Johnson and having produced an instructional video on Johnson’s guitar technique. His previous releases also tended toward traditional blues. But his new CD is very much in the singer-songwriter vein, imbued with some lyrics in the folk protest song tradition. It’s also a particularly fine example of an intelligent, literate singer-songwriter with very tasteful instrumental backing. As Ainslie points out in an interview, before he got into playing the blues and being a blues historian, he had developed a reputation as an old-time style fiddle player and clawhammer banjo player, and said that before that, he was a folk musician. Now that comes around again on The Feral Crow, and the result is a memorable album that recalls the style of Richard Shindell, with Ainslie’s rich baritone voice and often powerful lyrics, touching on subjects from a motorcycle accident to the kidnapping of a South African human rights advocate, with even a couple of love songs. He is joined by a excellent backing band of musicians from the Woodstock, New York, area, including bassist and producer Scott Petito, plus drummer Jerry Marotta, who has worked with people like Peter Gabriel, Marc Shulman on guitars, Peter Vitalone on keyboards, and Leslie Ritter, a fine singer-songwriter in her own right and formerly half of the duo Amy and Leslie, on backing vocals. In Ainslie’s own publicity material for the CD, he notes that even though it is not the blues stylistically, the songs touch on some of the same subjects. But The Feral Crow is more expansive lyrically. These are songs that Ainslie has been working on for a long time, some of which go back to the 1980s. There are also some semi-topical songs, including a song for peace, and one about the aftermath of Vietnam. And musically the songs get into some fairly sophisticated territory that is a long way from three-chord blues. Bluesman Scott Ainslie has definitely made a stylistic shift on his new CD The Feral Crow, but it shows his versatility. Far from being a bluesy album, the new CD is a particularly fine example of the singer-songwriter genre, with Ainslie doing both jobs very well. His lyrics are articulate and often powerful, and his vocal style is pleasingly warm. Add that to the very tasteful backing musicians, and one has a memorable album even in the very crowded singer-songwriter field. Our grade for sound quality is an unqualified “A.” It’s one of those now increasingly rare examples of great care being taken with the sonic presentation, and the temptation was resisted to pump up the volume on the CD. It’s a treat on a good sound system. Irrespective of Scott Ainslie’s reputation in the blues, his new CD The Feral Crow shows that he can also be counted upon as another worthy example of how the current period has become the golden age of singer-songwriters, with new music rivalling anything from the Sixties or Seventies.